No cold shoulders here. 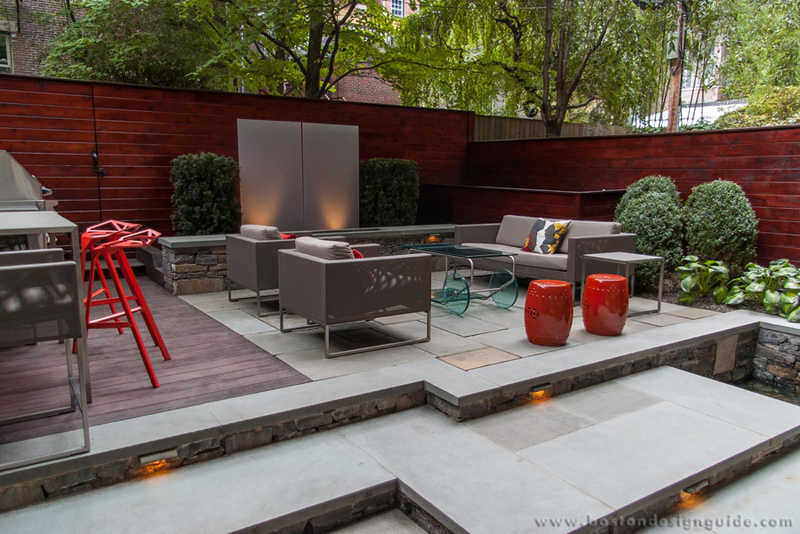 In New England, outdoor terraces are designed to last long into fall. Homeowners are still spending time in the great outdoors, but, sure as our leaves change color, the experience shifts. Instead of making a splash in the pool, we’re relaxing in steaming spas, circling around a fire, having drinks and a meal on a glowing outdoor patio, or commanding the grill while catching the game. 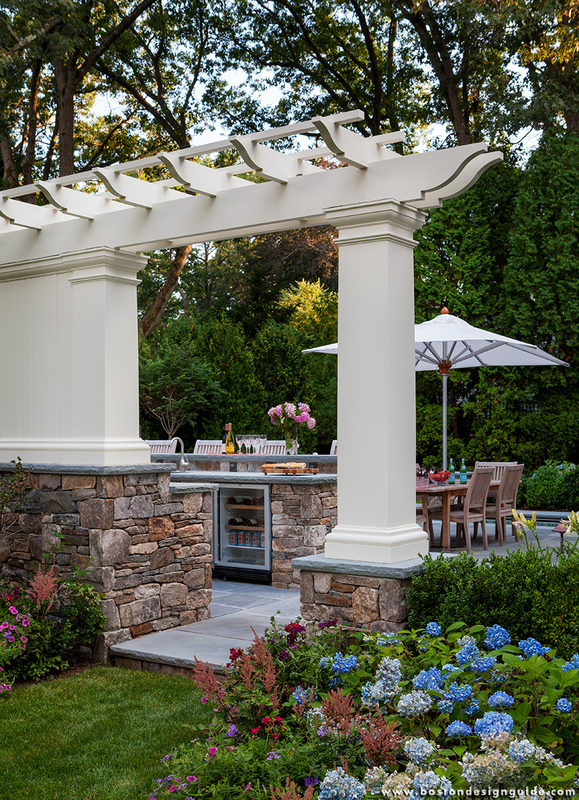 In a team effort by Dan K. Gordon Landscape Architects and Paragon Landscape Construction, a pergola design adds prominence to the kitchen of an alfresco entertaining experience, which also includes a fire pit and spa. 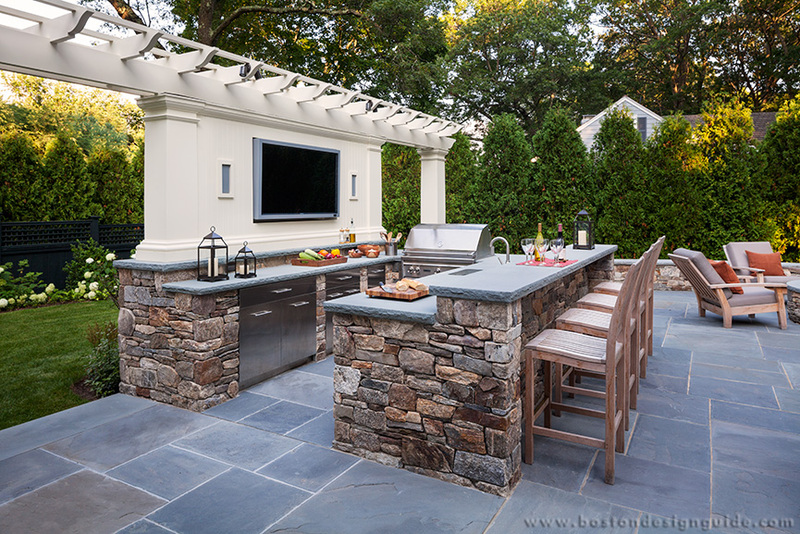 Refrigeration and plenty of storage is crafted right into the stone, while two tiers of bluestone countertops (complementing the paving) make it easy for the chef to socialize during food prep. 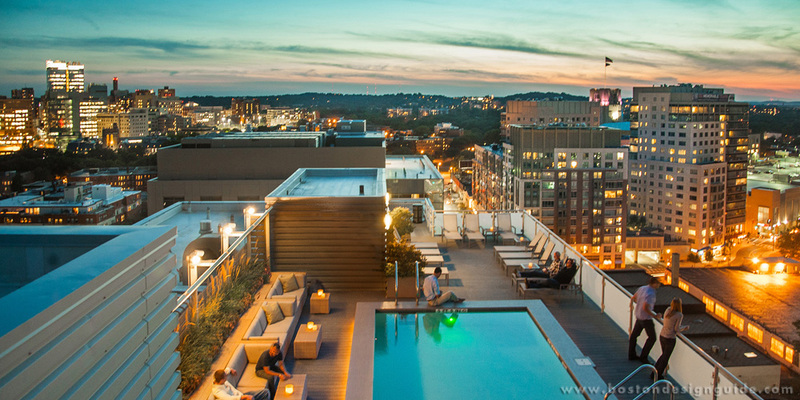 The absence of a pool as an outdoor amenity secures the terrace’s three-season status. Come dusk, the experience is cast in a different light, when the fire and candles are aglow, and outdoor lighting punctuates choice features. A glimmering spa allows guests and homeowners to relax in its healing waters and still have a view of the bar-side TV. 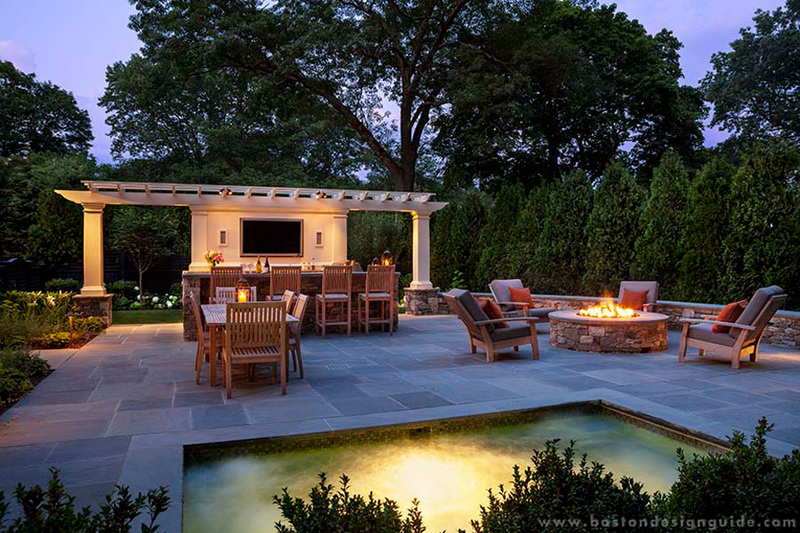 In another project, the very same dream team—Dan K. Gordon Landscape Architects and Paragon Landscape Construction—work their magic on a pool terrace in Wellesley. In autumn, this design is a feast for the senses. A crackling fire and pool spillway into the spa bring an audible appeal, while an ornate lattice wall, detailed gardens and landscape lighting imbue warmth and visual interest. While summer harnesses the tactile (sunshine’s rays, course sand and salty surf), to us, autumn engages the visual. Arguably the most atmospheric of the seasons, fall is our “last dance” before winter’s blanket of snow. Even though we may be less likely to don a swimsuit, we still gravitate poolside for as long as we’re able. 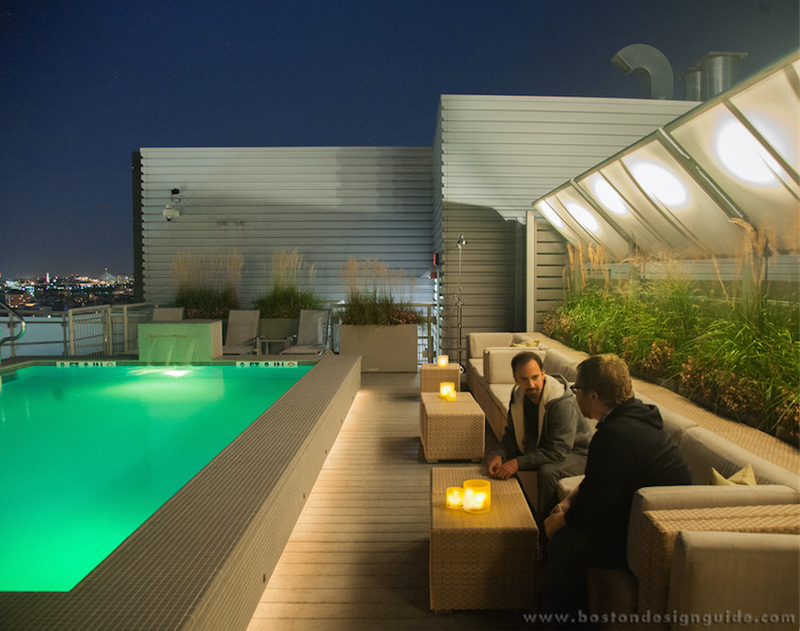 LeBlanc Jones Landscape Architects’ rooftop terrace is just such an example. The firm drew on the nighttime gleam of Fenway Park and the shimmering cityscape when creating this spare but luxurious sky-high hangout. Significant engineering constraints proved insignificant to the aesthetic; the project reflects its incandescent urban setting, rather than relying heavily on plantings and structure. The urban lounge, which is centered around a shallow pool, is kinetic come nightfall. Planters brimming with hardy grasses and plants line the plush seating areas and soften the industrial edges, while translucent canopies shield the sun by day and let in the stars by night. 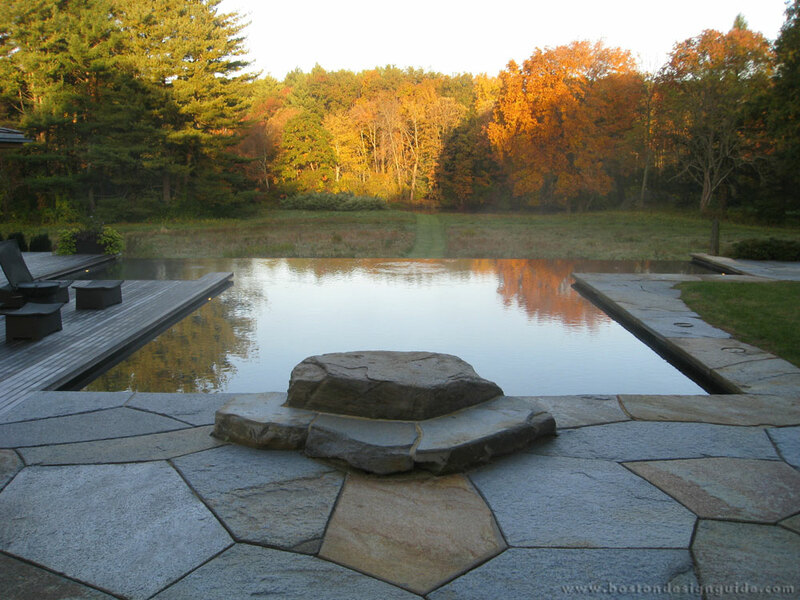 South Shore Gunite Pools & Spa’s idyllic pool above also seizes the beauty of its still waters, natural hardscape and autumn backdrop. Even though one may not feel inclined to take a plunge, this elemental scene is every bit as rich as that of a summer’s day. This is nature and design as art—one’s gaze soars from the mirrored pool, beyond its infinity edge and out to the fiery foliage beyond. 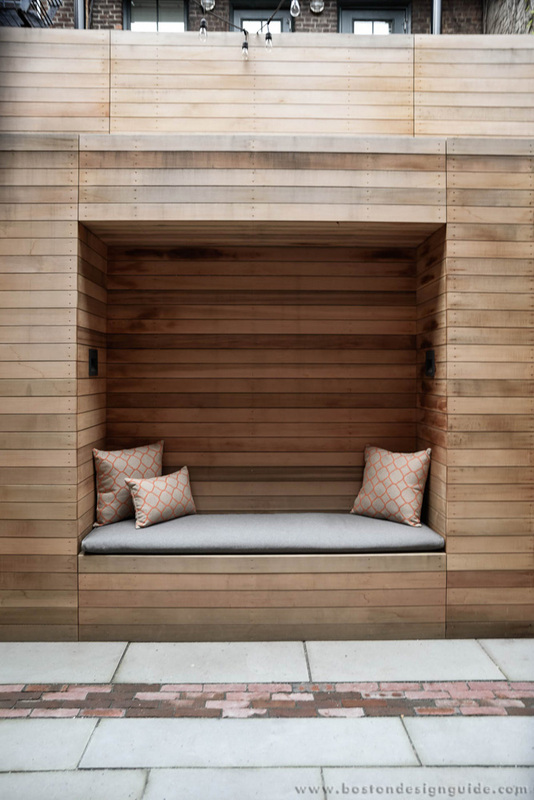 Cozy alfresco spaces are also enchanting this time of year, as cooler temps make it easy to linger and take full advantage of shoulder season designs. Case in point? 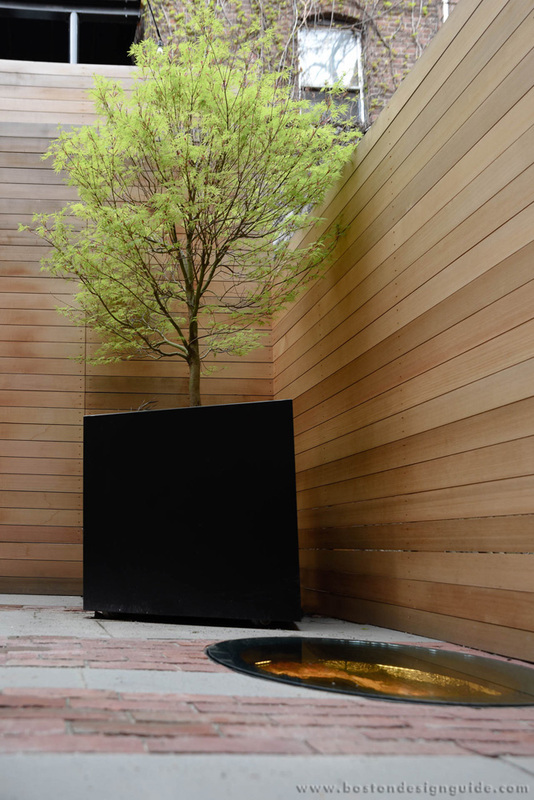 Landscape architect Matthew Cunningham’s garden (shown above) created for an 1890s row house in Beacon Hill. 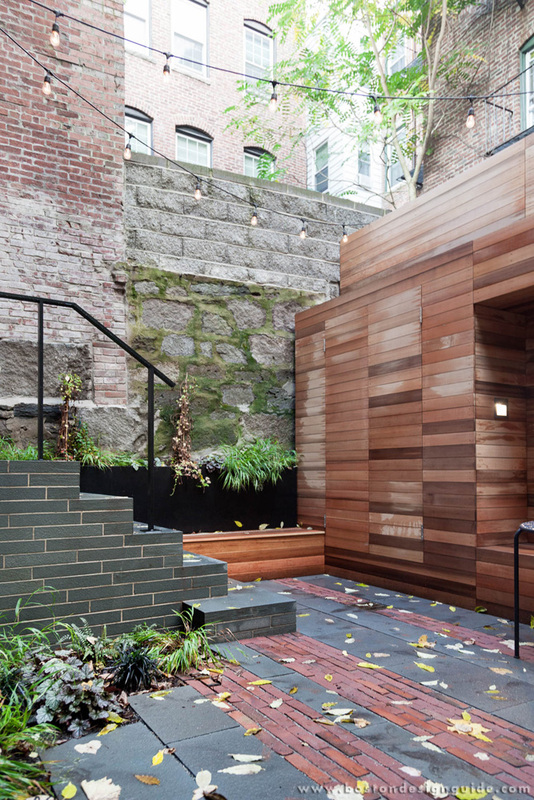 This small courtyard with big dreams boasts bands of bluestone and brick underfoot, and a custom shed and bench crafted from western red cedar along the entirety of one side. A sitting alcove carved into the wood, complete with lighting, provides an optimal perch to settle in with a book and a cashmere throw, but it’s the historic brick-lined drinking well that steals the show. Capped in glass and illuminated during the evening, the former hazard becomes an amber focal point that emits a soft warm glow, as well as a nod to the past. Until that first frost hits, hardy New England types often prefer the outdoor living room for impromptu entertaining. With hardscapes like the one designed by landscape artisans a Blade of Grass, pictured below, it’s not hard to see why. This graduated terrace is at once private and social, and features a designated grilling area and plenty of intimate seating. It’s a convivial gathering spot to pre-game, grill, brunch and cocktail, just remember to swap out those gin and tonics for Moscow mules!